Saturday, May 12th marked another successful event for Unchained at the Lawrence Community Shelter. Five volunteers loaded a trailer and a bike rack full of bikes out to the Shelter for a bike safety and training event. The Shelter’s clients listened to us explain the basics of bicycle safety and maintenance and received refurbished bicycles, helmets, locks and bike lights for their time. 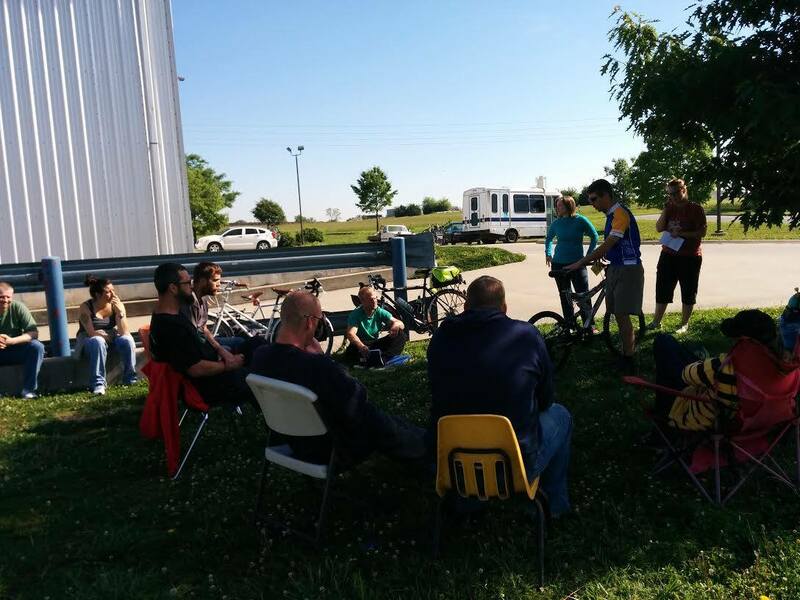 Following the seminar and bike fitting, the group took a ride from the Shelter out to the new interchange at K-10 and O’Connell road to practice riding skills and see a convenient and secure route for getting from the Shelter to east Lawrence by bicycle. In all, Shelter clients earned 12 bicycles by attending the training. In preparation for the event, we received $75 in cash donations, and many new items donated directly from our fundraising efforts, including new locks, lights and helmets. We appreciate the donations we received in support of this event, and look forward to future projects with the Shelter. We are still accepting donations.